I had my doctor's appointment yesterday, and my blood pressure and everything still looks good...very thankful for that! However, my cervix is sealed up tighter than Fort Knox. So now we talk induction possibilities...yikes! My doctor said we could induce at any time, and while we do really want to meet the little guy, the reality is if we induce now, it will very likely end in a c-section as my cervix is not favorable for a vag.inal delivery at this time. So we will most likely wait until the middle or end of next week to start the induction process, and I am praying for some progress by then. If it ends up in a c-section, it's not the end of the world, but we just want to give it the best shot we can at a v delivery. Edited to add: Glad you guys love my bag! I should have included the info originally - sorry! 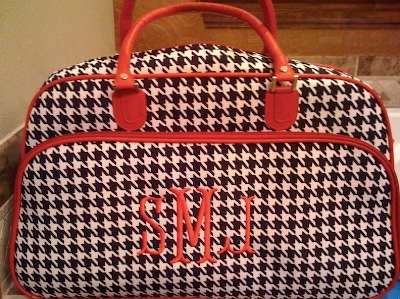 I ordered it from the Wholesale Accessory Market and it's called the Houndstooth Print Large Bowler Bag with Red Trim. 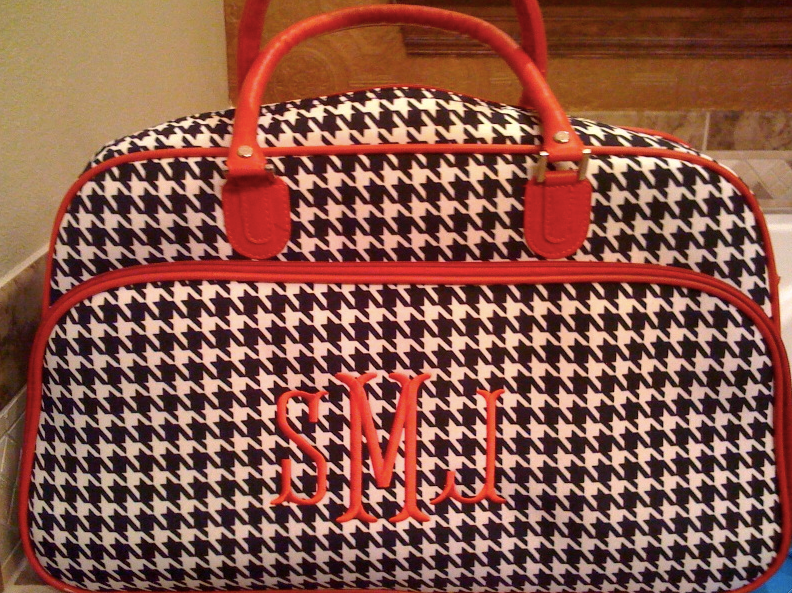 The bag was $12.90, and monogramming is $5.95. It is currently out of stock so doesn't appear on their site, but I saw it go in and out of stock several times before I ordered it. They have TONS of stuff at really good prices! There is a $50 minimum order, but it was super easy to reach that...great time to buy some unique gifts! So excited that you'll be holding that precious boy in less than 10 days!!!! :) So excited for you, girl! Praying that you start progressing and that a c-section isn't necessary!!! I just wanted to say congrats on your little boy. Boys are so much fun!! Not much longer and you will be holding him in your arms...greatest feeling in the world! I am also new to your blog! I enjoy all of your crafty ideas. They give me ideas for my little boy. I have a 9 1/2 month old, Brennen. Also your bag is so cute! Where did you get it? So glad you're waiting because you're right about induction ending in c/s when everything isn't "ripe." Your hospital bag is so cute! OMG! How time flies! I am saying a whole lot of prayers for you and your little one. Where did you get the bag? Adorable, I want one!! Whoo hoo! It's getting so close...will be thinking of you! Hello there! I'm new to your blog as well and must say I love your hospital bag? Where did you get it?! Please tell!! Good luck with everything!! So exciting!!! Praying for you guys. how exciting!! i can't wait to meet your little man!! he is going to be adorable! Wish we lived closer. We'd be best buds. I heart your bag. I was induced at thirty-seven weeks, and my cervix had not progressed any. My doc was sure because of that and the size of the baby, that I would have to have a c. But, I finally did progress, and at 8:30 that evening, Rhett was born. I hope that it goes that way for you! Good luck! I HEART your bag! I promise...a c-section is not that bad. A little more of a recovery (from what people say) but it is all I know. I was running around Waco four days after Cilla was born! Slower than normal, of course, but still out and about. The worst part was that I was in labor for 12 hours then had the c-section (I was just like you...sealed too tight!) I know how disappointed you are. I was there, too. But, looking back, it all worked out fine! Bottom line- you want a safe arrival and a healthy baby! Glad everything looked good for blood pressure! Sorry about the cervix! PROMISE the section is not as bad as everyone makes it out to be....especially if you don't labor first!!! I was the same way w/ both of mine. They just wanted to stay put! If you do the section, just get up & move asap bc that really does help & stay on your pain meds every 4 hours!!! Keep us posted! It's so exciting! Hearing your news and seeing that bag packed...ohhhh so exciting! Can't wait to see this little one! Can't wait!!! You are so close! Can't wait to "meet" your little man! I am so excited for you!! There is nothing like seeing your child for the 1st time!! YAY!! Love your bag too! Fort Knox? LOL I hope it happens soon for you! So exciting!!!!! But, I swear it seems like yesterday when you shared the news. Good Luck! Thinking of you! Great bag! Can't wait to see pictures of your little man!